[toc]The technical name of skin infection hives is urticaria. This is a common skin disease where red and swollen welts emerge on the skin. Specific cause of hives is still unknown but the health experts believe it occurs due to an allergic reaction. Hives usually happens due to a histamine release beneath your skin. You must understand that hives can merge together and form larger welts. However, this disease can also occur due to an autoimmune disease. Hives are of different sizes and they are not life threatening. But this skin infection can be bothersome as it causes burning and itching sensation on the affected areas of the skin. This disease usually can last up to 6 weeks and the skin infection clears on its own. But there are certain home remedies that will help alleviate the symptoms of your problem. According to the health experts, the most common home remedy for the skin infection hives are the over the counter medications. Antihistamines are easily available in the pharmacies. When this medication is applied, it will inhibit the excess release of the histamines in your skin. This can only happen when the capillaries are dilated. The antihistamines will decrease your itching. Loratadine, diphenhydramine and cetrizine are some of the antihistamines available in the pharmacies. 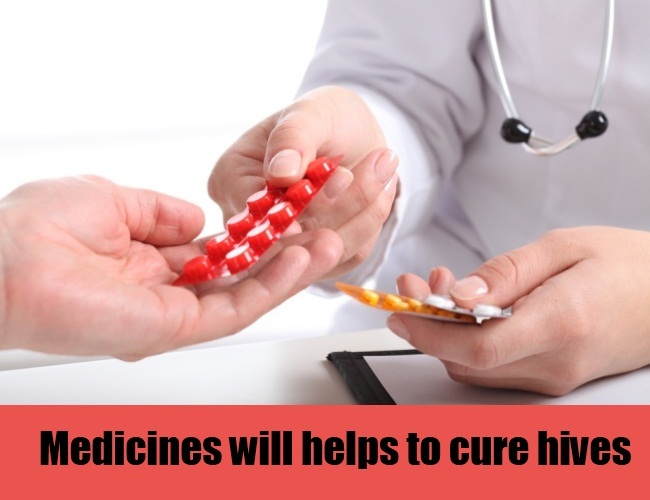 You must consult a doctor before taking any sort of medication. 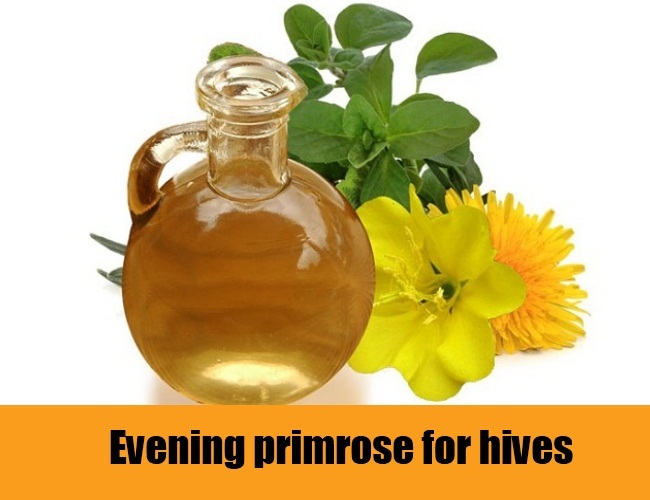 According to the health experts, evening primrose oil is not only beneficial for the stomach and respiratory troubles but it also helps greatly in decreasing the itching and burning sensation which is related to eczema, hives and dermatitis. The evening primrose oil has a rich content of GLA or gamma-linolenic acid. If you have hives you must consume two to eight grams of this oil each day. 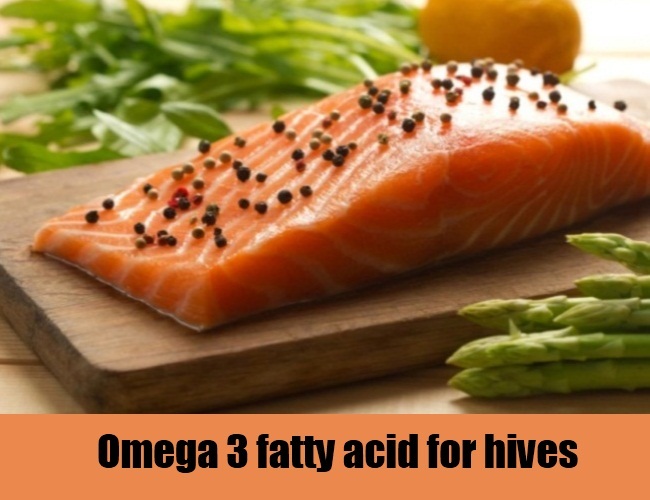 The health experts around the world suggest the victims of this disease to take omega-3 fatty acid supplements daily in the diet. This is an important supplement that you must introduce with the evening primrose oil. You must consume fish oil, cod liver oil etc daily as a part of your diet. The fish oil will help in promoting optimum health and will help in decreasing the symptoms of this disease. You can always consult a health expert to understand what sort of omega 3 fatty acid supplement will work the best for your body. This is an effective way to reduce the appearance of the hives. 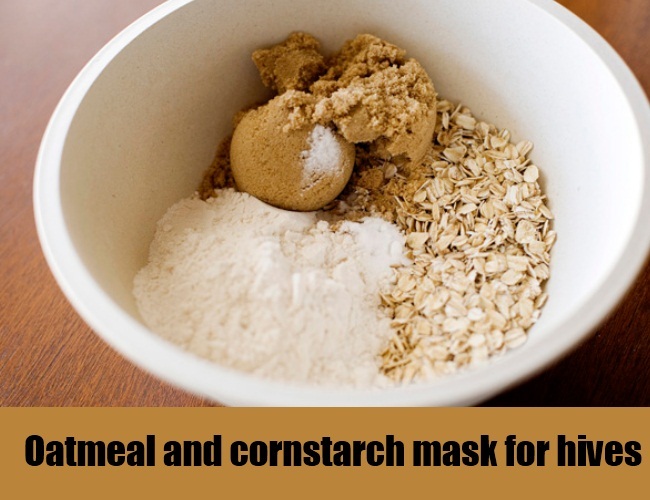 All you have to do is to make a paste of oatmeal and cornstarch. Take two cups of powdered oatmeal and three tablespoon of cornstarch. You will have to mix enough water in it to make it a paste. Take this paste and apply it directly on the affected areas of your skin. Keep the paste on the skin for 15 minutes to half an hour and then rinse well. This paste will help in dehydrating the hives within less than a few hours. Alternatively, you can also add oatmeal and cornstarch in a cool bath. 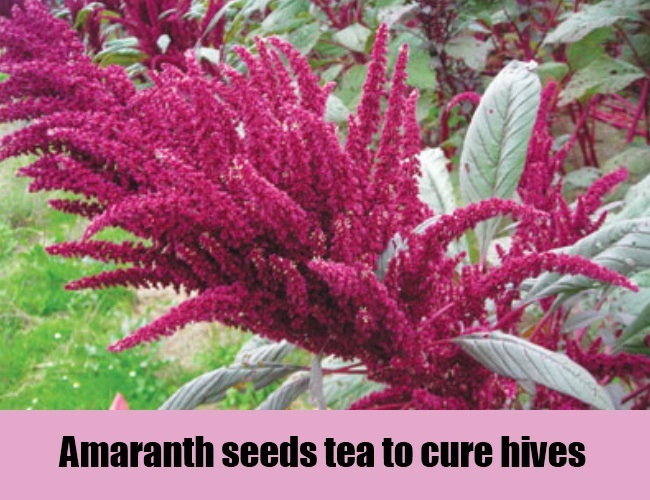 Amaranth is a famous herb and has been used in Vedic, Chinese and several other medicines for centuries. This herb has medicinal and nutritional properties. The seeds of this famous plant have been used as an astringent for preparing a mouthwash, acne and hives problems. If you want relief from hives and prevent it from recurring then take three tablespoon of amaranth seeds and add it to three cups of boiling water. You must drink the entire potion after letting the seeds steep into the boiling water for some time. This remedy must be repeated everyday till the hives go away. Ginger is readily available in the grocery stores worldwide. This is a simple home herb that is used widely as a medicine for curing a lot of diseases. 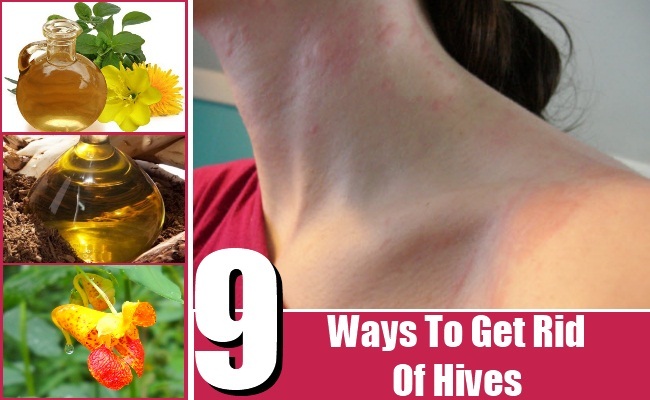 This herb will help in eliminating the itching and burning of the hives. 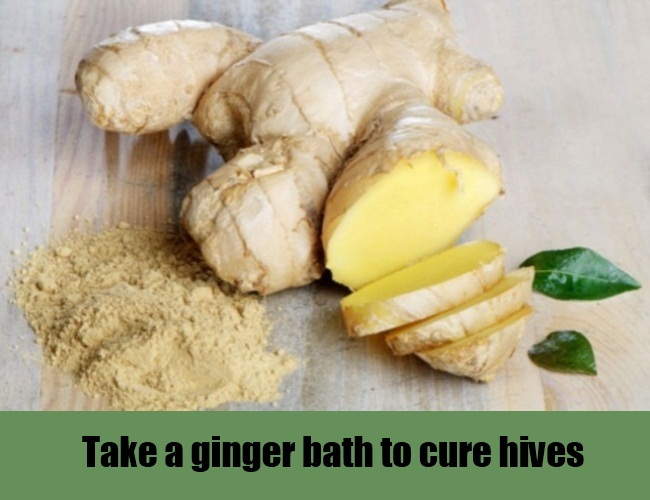 You must boil half a pound of ginger in one gallon of water. Mix this water with your normal bath water and soak in this bath water for at least 30 minutes. You can also take ginger supplement for this problem. 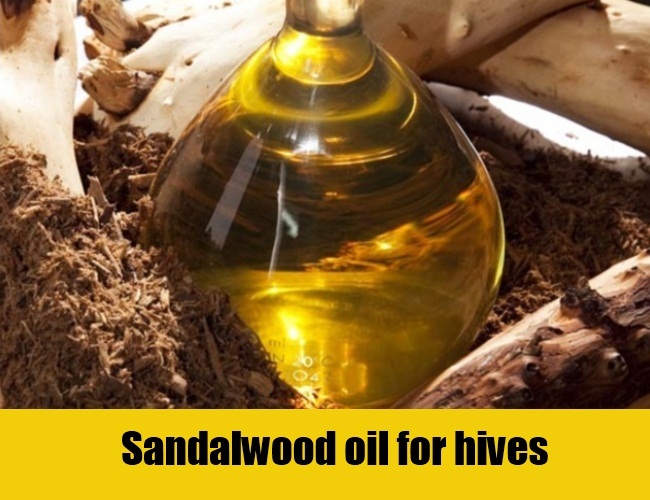 Sandalwood oil is another great home remedy for the treatment of hives. Sandalwood is used for diminishing the itching and calming the burning sensation that is linked with this skin infection. You must generously apply the sandalwood oil on the hives and other areas of the skin. You can apply the sandalwood oil on the affected areas with the help of your hands but take care and wash them immediately after application. Leave the oil on the skin and let it seep inside your skin. You can repeat the application process after three hours. There are a lot of fresh herbs that can help in alleviating the symptoms of this skin infection. You can use the fresh jewel weed. 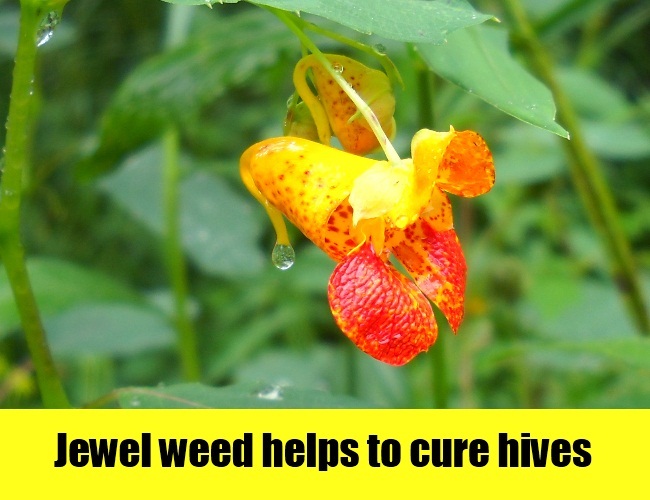 Crush the jewel weed and rub it onto the affected areas of your skin. You can also drink a concoction made with the jewel weed seeds. The tea made out of jewel weed and the plant itself can be used together to make a poultice. This can be applied on the hives for immediate relief. You can also add the jewel weed tea in your bath water and soak in it for half an hour. 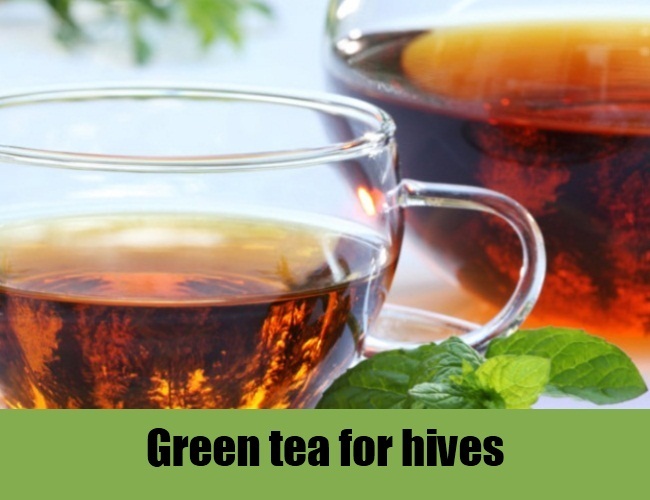 Green tea has antihistamines and antioxidants that will help in alleviating the itching and burning sensation caused by this disease. All you will have to do is fill a teapot with water and allow it to boil. You can add 5 to 10 bags of green tea to the boiled water and allow it to steep for five minutes. Remove the tea bags and pour yourself a cup. Drink this tea to soothe the itching and burning sensation. You can prevent the future bouts of this attack by drinking green tea on a daily basis. You can drink this potion with your breakfast or in the afternoon! You can also mix green tea in your bath water and soak in the water for 30 minutes!